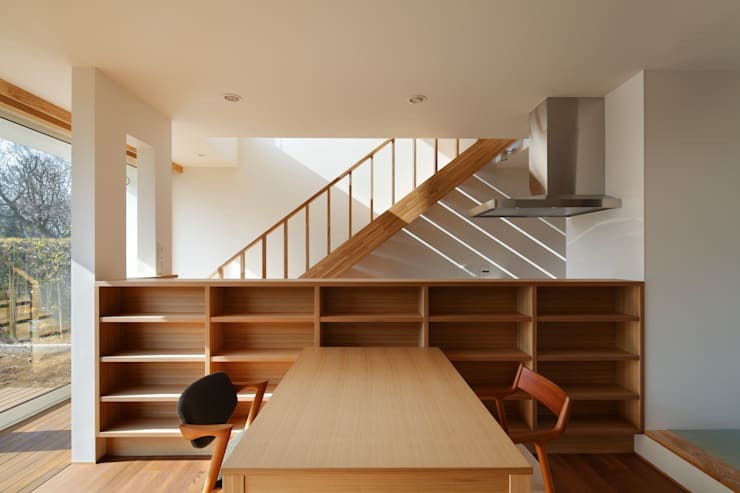 This thoughtfully refined, and modest, 98 square meter home is located in Kawasaki City, Japan. Characteristic of Mukoyama Architects, the home adopts a minimalist aesthetic that manages to strike a beautiful equilibrium between austerity and gentle finesse. Minimalism came to recognition in the western art world post world war two, however, these notions emerged in Japan as early as the Higashiyama culture of the fifteenth century. The aesthetic principal of wabi-sabi reflects a deeper world view that embraces transience and imperfection. Derived from Buddist teaching, it is thought to nurture authenticity through the acknowledgement of three things; nothing lasts, nothing is finished and nothing is perfect. The roughness and irregularity of the cast concrete retaining wall, the simplicity, the austerity, all speak the language of wabi-sabi. 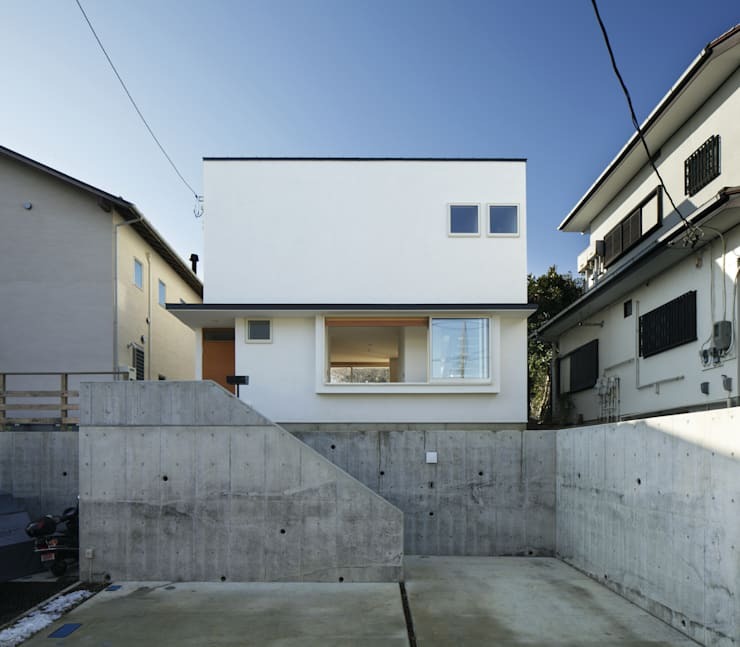 The site was approximately three meters higher than the street level, requiring the construction of retaining wall and stairs up to the house level. The cast concrete wall stands guard, unrelenting, almost oppressive. There has been no attempt to 'finish' the irregular surface, confidently asserting it's imperfect beauty. Beyond this asperity, the smooth and stark white finish of the home stands in contrast—without deviating from an unspoken minimalist manifesto. For other minimal—and not so minimal—exteriors, take a look at these houses. The interior employs the same restrained vocabulary—white walls are delicately balanced with warm natural timbers. 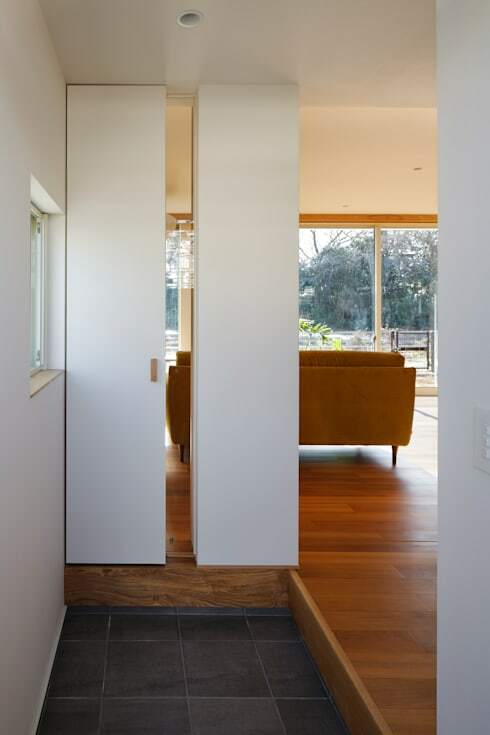 Here, we can see that a single step separates the level of the living area from that of the entry hallway. This single step is often employed in Japanese architecture to express the threshold, separating in from out. Shiiki, the term used to denote threshold in Japanese, separates activities, preserving their difference. It elevates the moment of betweenness; between in and out, oneself and their environment or situation. This very subtle element of the design is effective in it’s poetic simplicity. The home opens to the south, accessing a wild field-like garden. Functional and aesthetically pleasing, it is intended as a vegetable patch in as much as it is a space for leisure and enjoyment—and it is not only enjoyed from the outside, but from the inside of the home also! The large glass sliding doors allow for a seamless transition between the interior and exterior, coupled with the orientation of the home they afford the living space ample natural daylight. Regularity and irregularity enter into a delightful tension. The shelves, one stacked upon another, are perfectly regular—the center line of the table directly corresponds the center line of the shelves. Then, unexpectedly, the symmetry is broken. Two different chairs face each other—their close proximity highlights their difference, celebrating it. Has this living space given you some interesting ideas? Would you like more? If so, take a look at the various examples compiled here! 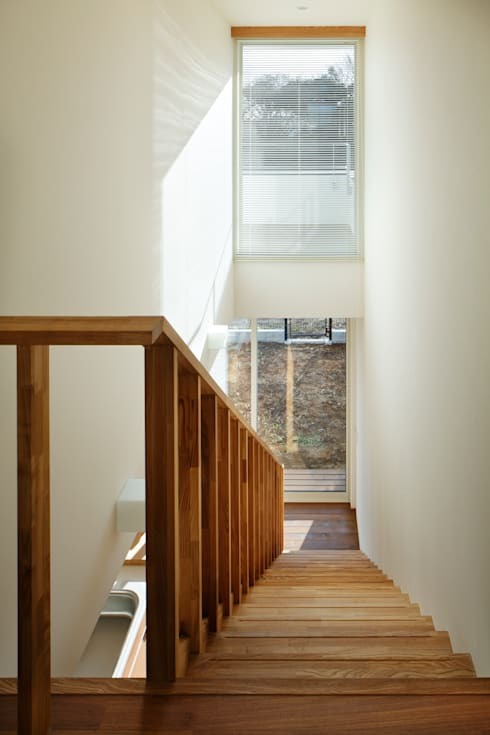 The double height volume over the stairwell forms a light-well. A vertical slot frames the view to the garden, allowing light to penetrate the space before softly filtering down through open steps. The crisp white reflects the abundance of natural light, and again, the natural timber provides the only contrast. If you enjoyed touring through this thoughtful and considered Japanese design, you may also like to take a look at this Secret Japanese Garden and Home. 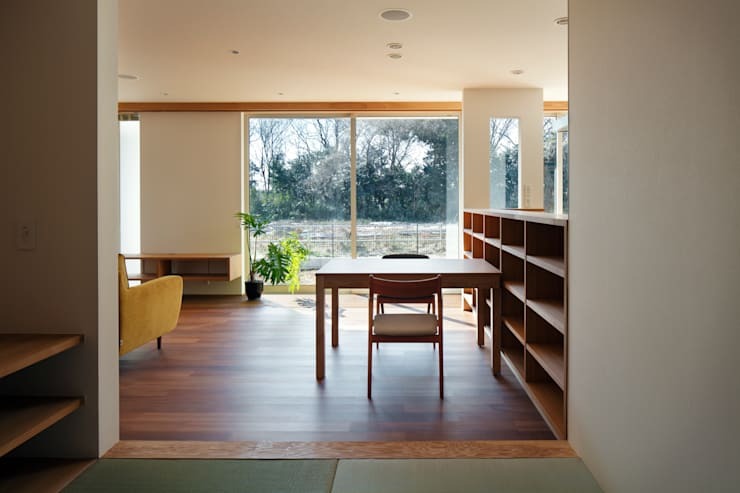 What did you think of this Japanese homes refined minimalist design? Let us know in the comments below!